Dealing with a hazardous situation like a fire emergency can be a dangerous experience. If the right action is not taken at the right moment the result could be devastating. Although there are globally accepted procedures to follow in an emergency at least to minimise damage, this procedure it looks like has never been put into practise in many recent cases reported in the city and the suburbs. 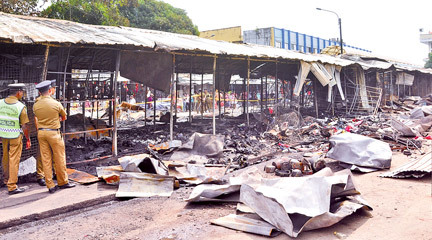 The latest major reported incident was in Bodhiraja Mawatha, Pettah and was a good example which led to the destruction of 104 shops which were gutted due to the failure to act on time. Colombo city is guarded by the Colombo Fire Brigade, the headquarters of which is situated on Darley Road and is run by the Municipal Council. It has two sub stations in Kotahena and Bloemendal with a well- trained crew and a fleet of sophisticated fire fighting vehicles including fire engines, water bowsers and high lift cranes. The main control room operates 24 hours a day throughout the seven days to receive emergency calls at any given time. Teams of crew wait on high alert even in the middle of the night with heavy equipment being within reach while engines are fuelled up with bowser loads of water- all to act immediately in an emergency and minimise damage. The irony is how many would take the full benefit and advantage of this service and help to create a fire safe society. The main point in a fire emergency is to move out safely through the designated fire exits if you are indoors. The next is to inform the Fire Brigade as soon as possible. It has been found that on very many occasions victims try out their own impractical moves and methods to douse a fire and then it is far too late for the Fire Brigade to act. This is commonly seen in instances where there is no proper procedure laid out to follow in an emergency and that the people act on their own instinct. Outdoor establishments such as market places and pavement shops as well as lines of slums may fall into this category. The Bodhiraja Mawatha fire in early December was a classic example where people operated on their own initiative instead of informing the Fire Brigade at once. By the time the fire fighters reached the scene, over a 100 shops were gutted. What was left for the fire Brigade to do was to soak the area with water and prevent the fire from spreading to surrounding establishments. As soon as the fire was observed vendors had began dousing it with buckets of water and taking away whatever valuables they could carry. This showed the lack of knowledge of the public on how to act in a fire emergency and the necessity to educate them . 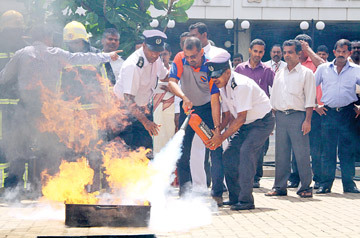 As a result a series of fire prevention awareness programs were designed to be held by the Colombo Fire Brigade. Crucial and congested commercial areas like Colombo Fort and and the Pettah with a high population density were selected for the first phase of this program which was held for a week from January 27 to February 2. A series of awareness programs were held in selected spots where the public gather most like the market, bus stand, railway station and bazaars. 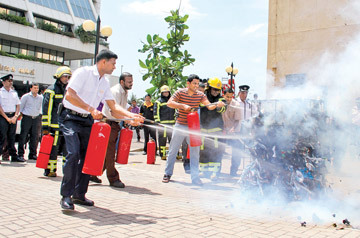 A special demonstration was also held at Echelon Square opposite the World Trade Centre in Fort on Friday where the public was educated on how to act quickly in a fire that could happen in an office environment. In this instance onlookers were educated on how to use modern fire extinguishing cylinders that come in different forms and for different purposes. the public was given the message to inform the Fire Brigade no matter how small the fire maybe. 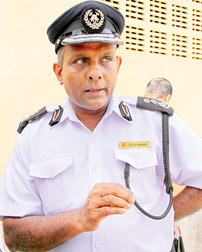 Colombo Chief Fire Officer Rohitha Fernando talking about the importance of this program said that it was not sufficient to only have a sophisticated fire fighting unit with a well- trained crew but the public has to be aware of how to act in an emergency in the first place. What initial steps have to be followed, how soon the Fire Brigade has to be informed and safety precautions were vital points to be considered in an emergency. small fire drills will be conducted in selected locations to display the public how to act and extinguish a fire prior to the arrival of the Fire Brigade at the scene.